Stereo-array isotope labeling (SAIL) has been combined with the fully automated NMR structure determination algorithm FLYA to determine the three-dimensional structure of the protein ubiquitin from different sets of input NMR spectra. SAIL provides a complete stereo- and regio-specific pattern of stable isotopes that results in sharper resonance lines and reduced signal overlap, without information loss. Here we show that as a result of the superior quality of the SAIL NMR spectra, reliable, fully automated analyses of the NMR spectra and structure calculations are possible using fewer input spectra than with conventional uniformly 13C/15N-labeled proteins. FLYA calculations with SAIL ubiquitin, using a single three-dimensional “through-bond” spectrum (and 2D HSQC spectra) in addition to the 13C-edited and 15N-edited NOESY spectra for conformational restraints, yielded structures with an accuracy of 0.83–1.15 Å for the backbone RMSD to the conventionally determined solution structure of SAIL ubiquitin. 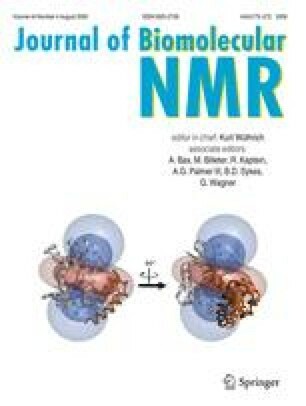 NMR structures can thus be determined almost exclusively from the NOESY spectra that yield the conformational restraints, without the need to record many spectra only for determining intermediate, auxiliary data of the chemical shift assignments. The FLYA calculations for this report resulted in 252 ubiquitin structure bundles, obtained with different input data but identical structure calculation and refinement methods. These structures cover the entire range from highly accurate structures to seriously, but not trivially, wrong structures, and thus constitute a valuable database for the substantiation of structure validation methods. We thank Dr. Akira Mei Ono for help in preparing the SAIL amino acids. We gratefully acknowledge financial support by a Grant-in-Aid for Scientific Research of the Japan Society for the Promotion of Science (JSPS), and from the CREST program of the Japan Science and Technology Agency (JST), the Technology Development for Protein Analyses and Targeted Protein Research Program of the Ministry of Education, Culture, Sports, Science and Technology of Japan, and the Lichtenberg program of the Volkswagen Foundation.